You probably recently received a ballot asking you to decide on continuing the EMS Levy. Your Spokane firefighters are asking you to vote YES on this proposition. This levy was first approved in 1980, and has been approved every six years by Spokane voters. The levy continues a 50 cent assessment per $1000 of home value. In other words, a $100,000 dollar home gets assessed $50 per year. Every Spokane firefighter pulls double duty as an EMT or paramedic. The EMS levy is the sole funding for up to 90 firefighters, well over a third of us. Because this is a levy, just a simple majority saying, “yes” will not be enough to assure the majority’s will. We need over 60% approval to continue the EMS levy and continue this current funding for the fire department. That’s why your vote is so important. Thank you for your support in the past. Please vote YES for EMS today! We've had some good letters for the EMS Levy in the Spokesman-Review. Thanks to all who have written. 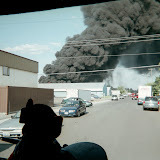 NARRATIVE: On 04/13/2010 at 0632 hours, the Spokane Fire Department responded 3 engines, 3 ladders, 1 pumper-ladder, and 2 battalion chiefs to a reported structure fire at 1824 W Maxwell. The first arriving company, SE3, reported heavy smoke and fire coming from a 1 story residential triplex. Two of the initial arriving companies were assigned to search the structure for residents while other companies began a coordinated attack on the fire. These efforts resulted in a quick knockdown of the fire and limited the extension from the fire unit to the rest of the structure. There were no injuries to civilians or firefighters. PROBABLE CAUSE: This fire is under investigation by the Spokane Fire Department Special Investigations Unit. DAMAGE EXTENT: The involved unit sustained severe fire damage with some extension to the exterior walls and roof. Pizza Hut is helping the Save John Knighten fund by offering to donate 20% of all their proceeds from this Thursday, the 15th! You must have a voucher in order to take advantage of this. You can either ask for one in person at the counter or you can go on-line to the Save John Knighten site (http://www.savejohnknighten.com/) and they have a link to a printable coupon. This is for delivery or take-out only, since they have no inside dining at this location. Some vouchers have also been delivered to most fire stations. Let's all have pizza for lunch or dinner this Thursday and help a friend. Thank you. And a big thanks to Pizza Hut (South Hill) too !!! NARRATIVE: Today the Spokane Fire Department responded at approximately 5:00 PM to 1708 East 10th Avenue on a reported structure fire. The first crew on-scene reported heavy fire showing from the front porch of the 1-story, wood framed residence. Fire fighters aggressively attacked the fire from the interior of the structure while additional fire crews completed search and rescue, roof ventilation and salvage and overhaul. The fire was brought under control within 20 minutes. There were no reported injuries to civilians or firefighters. 8 fire companies with 27 firefighters responded to this fire and were on scene for approximately 2.5 hours. DAMAGE EXTENT: Fire damage was confined to the front porch and attic space of the structure.